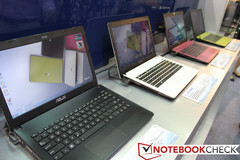 Although the Windows 8 transforming notebooks and tablets took the spotlight yesterday at the Asus conference, the Taiwanese manufacturer still has more up its sleeve on the show floor. Not to be confused with the 2-year old MSI X400, the Asus X401 will be Asus's next colorful 14-inch notebook series to run Windows 7. Features include 2-second resume times, chiclet keyboard, textured lid and both matte and glossy screens. The colors on display on the show floor included red, pink and lime green with a somewhat flushed large touchpad. According to Asus, the budget lineup will support not just Intel Core i3 CPUs (unknown if Sandy or Ivy Bridge), but also Pentium and Celeron processors as well with integrated GPUs, 4GB RAM, 1366x768 resolution display, and up to a 5400RPM 750GB HDD. Overall, the unit is expected to weigh 1.8 kg (3.97 pounds) with a thickness of 26.5 mm (1.04 inches). Upon closer inspection, we were able to single out the TN panel type and the 1x USB 2.0, 1x USB 3.0, combo 3.5 mm audio port, RJ-45, card reader, HDMI and VGA-out. An official launch date for the X401 still alludes us, but we suspect that the series will be ready for market later this year based on its listed specs.